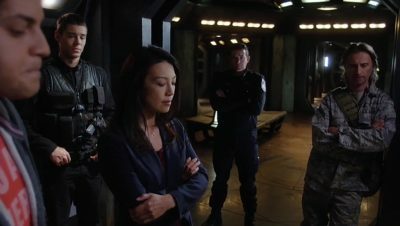 The mid-season finale of Stargate Universe is entitled Justice and brings forward the conclusion of the ongoing issues with Sgt. Spencer who more than many has been having serious issues and coping with self medication. Now we know that whatever drug he has been taking has run out and his behaviour has become more extreme over the last few weeks culminating with an assault and bullying of Franklin in particular. The events that take place on Destiny are shocking but offer an opportunity for both Rush and Wrey to gain control over the ship and while both are complicit in the events as they unfold as always Rush has his own very personal agenda. Justice begins with a truly humorous scene more so because Greer is at its center, there is a good bonding moment between him and some of the scientists which gets derailed when he investigates the missing Spencer and finds his body with a bullet hole in it’s head but no weapon. The scene certainly implies suicide but the missing gun points to at worst murder and at best some other nefarious plot. The weapon is found in Young’s quarters by Eli and Wrey uses this to undermine the military control of the ship through a hearing (approved by the IOA) but much to her annoyance Chloe is treating the hearing with respect. Wray was looking for an easy takedown but can’t seem to handle the fact that a civilian could be arguing for due process and a balanced look at the facts. It’s quite clever that the writers didn’t give us any reason to really like Camille but then they gave us her homelife and a 180 degree turn in her character but now back on the ship she’s back to well her professional self and not much to like there. Spencer himself was another character we were not meant to like, we knew little about him and his stealing of supplies and mysterious drug use were red flags but ultimately he was perhaps the first of the true casualties, he was broken before reaching the Destiny and had no avenue to seek help, others sacrificed or were selfish or simply met an unfortunate end but Spencer was a victim in the truest sense. Eli once again is feeling the pressure of being privy to secrets and of course we get the final straw of the fragile relationship between Young and Rush. Pity the discover of the spaceship on the planet came so late in the FTL downtime, who knows what they could have learnt.